Q. Hey Bill, I have heard that ponds can be productive during the winter months. Is this true, and can you offer some insight on this? Bill: Why, sure. I am always glad to cast out a line of thought. When water temperatures drop into the low 40s, all comfort diminishes … food intake is less, feeding times are briefer and less often and they prefer to strike smaller lures than larger ones. Like I said earlier, bass that live in our larger lakes with deeper water have choices. But in a small pond, choices are far more limited. They’ve gotta accept what’s available, but they will bite if presented the right lure with the correct presentation. Let’s discuss another type of pond and how water temp affects it. Let’s say a pond was dug and filled by damming off a small flowing creek. Now, this presents a quite different situation. This pond has a small overflow or spillway with current moving over or through it. The small shallow creek that flows from the upper reaches meanders its way through the countryside until it reaches the pond. During the winter the creek, being shallower than the pond is exposed to cold run-off from possible snow or ice melt and cold rain plus the air temp. The small spillway at the dam draws or pulls the current, and it’s guided down one side or through the middle of the pond, depending on its location to the drainage area. Normally the trough at the dam will be the deepest, and the floor of the pond progressively tapers shallower up towards the head of the pond. The deepest water close to the dam will normally be a few degrees warmer than other parts of the pond. The current path will be the coldest. Therefore, it’s smart to work deep areas away from the current on cold days. Now, let’s look at it another way. Suppose we’ve had several warm nights and days with several hours of a heavy, warm rain and a southerly 10- to 15-mile an hour wind. Now, the shallow flow or discharge of current from the creek has flip-flopped from cold to warmer water. In this situation, you should concentrate on fishing the warmer current areas and the shallower sections of the pond. 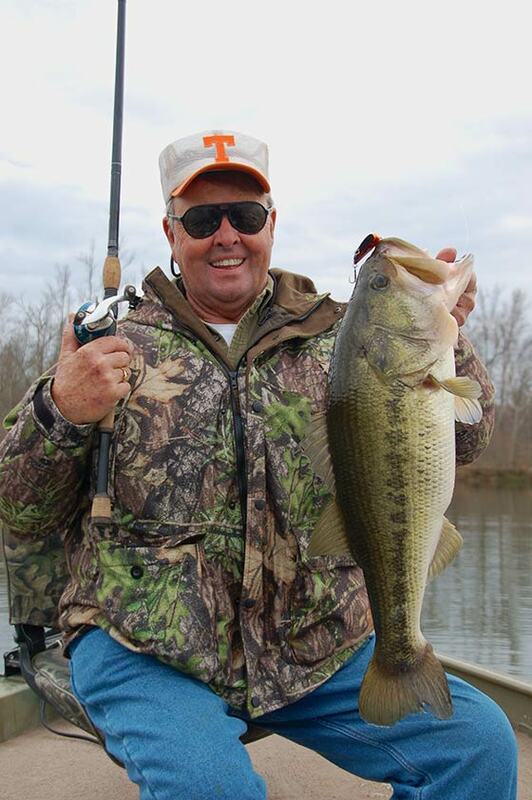 When fishing a farm pond during the winter, one must understand success seldom comes easily. But it will come if you think in terms of how bass and the pond you’re fishing react to water temp, and how to adjust your thinking to fishing extremely slow during these cold months. If you do this, success can be only a cast away.